Finally, the Chevron Latte Shirt is complete! This shirt was a lot of work. Not only was the detail work intricate, but other items such as the collar, pocket and cuffs gave me problems during assembly – and as I covered in Part 2, the front pocket was a complete re-do. (Click or tap for closeups of any of the photos). The pattern alterations worked well. The tightness across the front of the shirt is gone, and the shoulder slope adjustment has eliminated the drag lines from shoulder to chest. 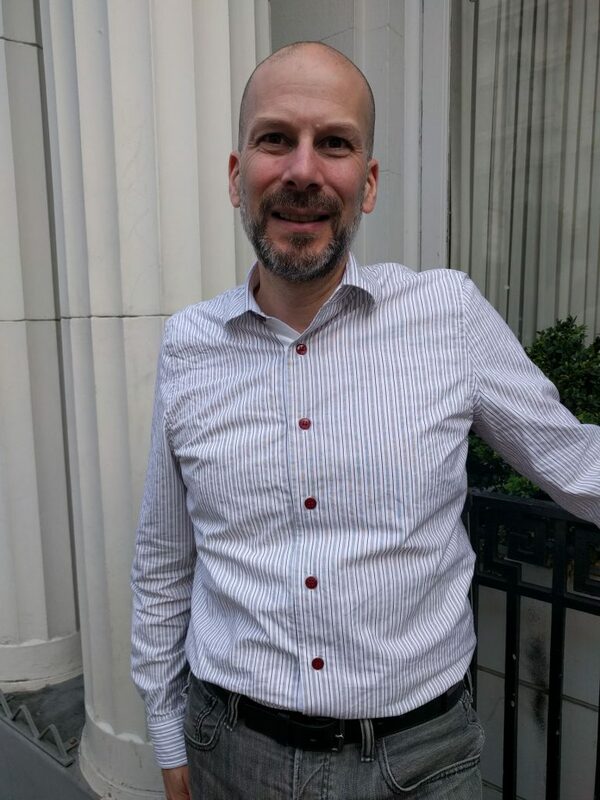 This photo does show a minor wrinkle line running from left shoulder to center front, but it’s more of a fluke the way the shirt was laying when the photo was taken. 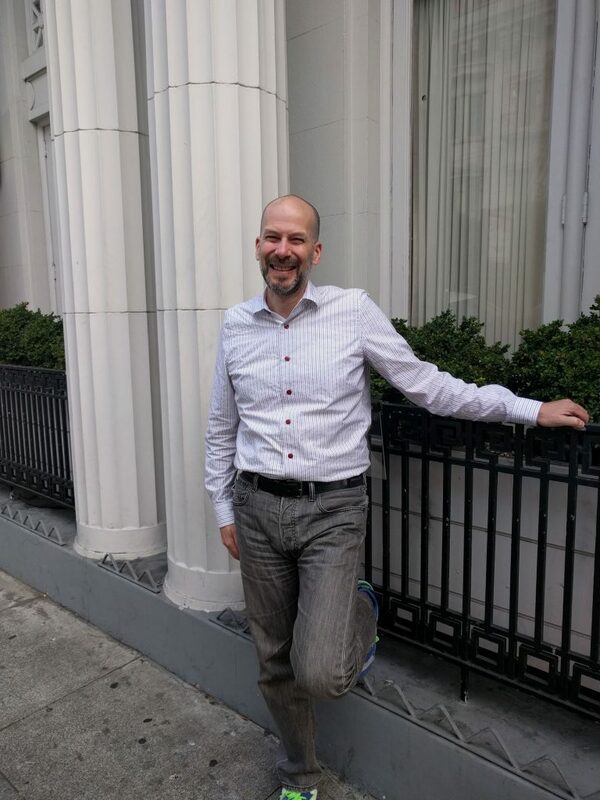 The fit is especially good considering my shoulders are asymmetrical, and I will never get an exact fit without making what’s called a “complete pattern” – separate pattern pieces tailored for right and left. Truthfully, I don’t think I need to. This entry was posted in Completed Projects, Shirts and tagged chevron-latte-shirt on August 30, 2016 by mportuesisf. 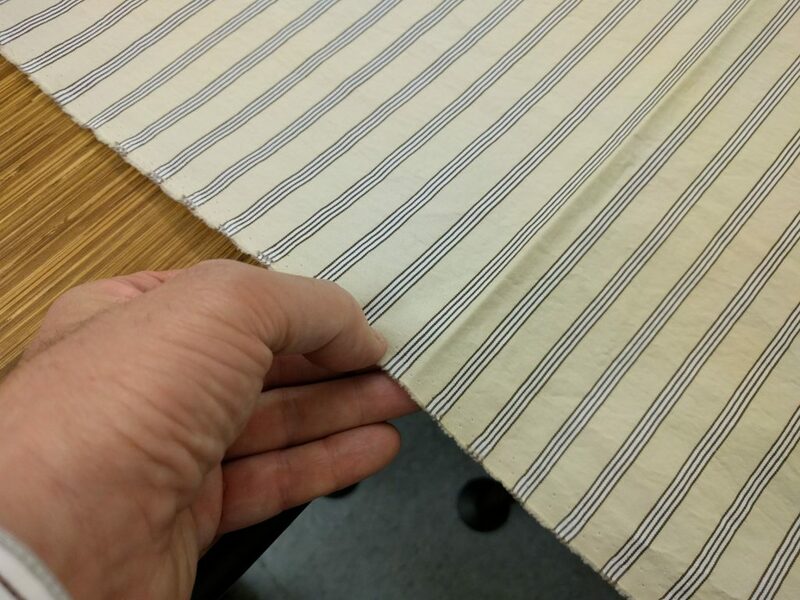 I chose another fabric from one of Michael’s Fabrics shirting bundles. The cut was pretty generous – a few inches short of three yards in a 60-inch wide fabric. So I had plenty to work with. This entry was posted in Shirts and tagged chevron-latte-shirt on August 29, 2016 by mportuesisf. The journey to the Pink Shirt (I haven’t forgotten about it) has so far spawned not one, but two side projects that have surprised me with the results. The first was the Peppermint Stick Shirt, and the second is what I’m calling the Chevron Latte Shirt. 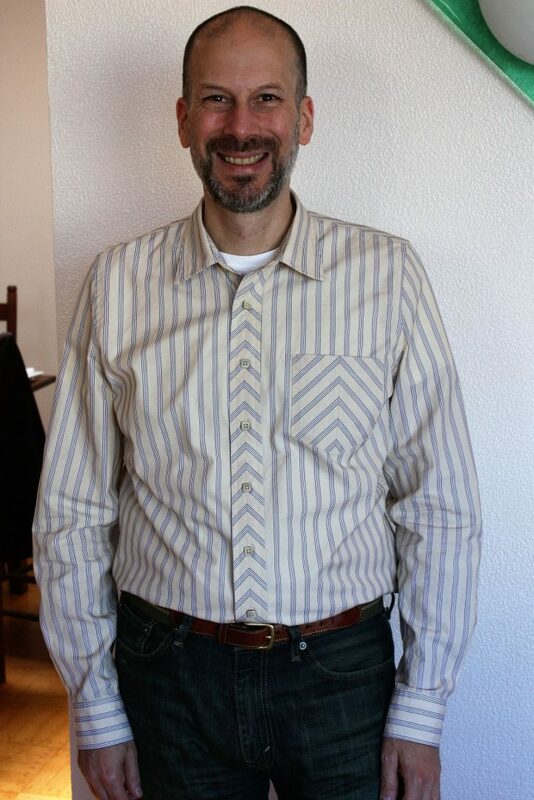 I’m presenting the Chevron Latte Shirt in three blog posts. Today’s is the first, covering the pattern work to address the fitting issues. The second will cover construction details, and the third will show the finished shirt. (Impatient readers can see work-in-progress photos on my Instagram feed). When I finished the Peppermint Stick Shirt, I noticed the pattern still had some minor fitting issues. When fully buttoned, the front of the collar felt a little tight, as if it were cutting into me. (The back of the collar felt fine). The front band, right below the collar, buckled a bit between the collar and the first button when the collar was fully buttoned. With the collar unbuttoned, two drag lines ran from the shoulder tips to the second button of the shirt. The shirt felt a bit tight across the upper chest at shoulder level in front. This entry was posted in Pattern Alteration, Pattern Fitting, Shirts and tagged chevron-latte-shirt on August 29, 2016 by mportuesisf. The Sips N Sews studio, where I do a lot of my project work, offers several beginner’s sewing classes. One of them is a “pajama shorts” class, otherwise known as boxer shorts. Jess, the Sips N Sews operations manager, showed me the assembly steps for the pattern used in the class. 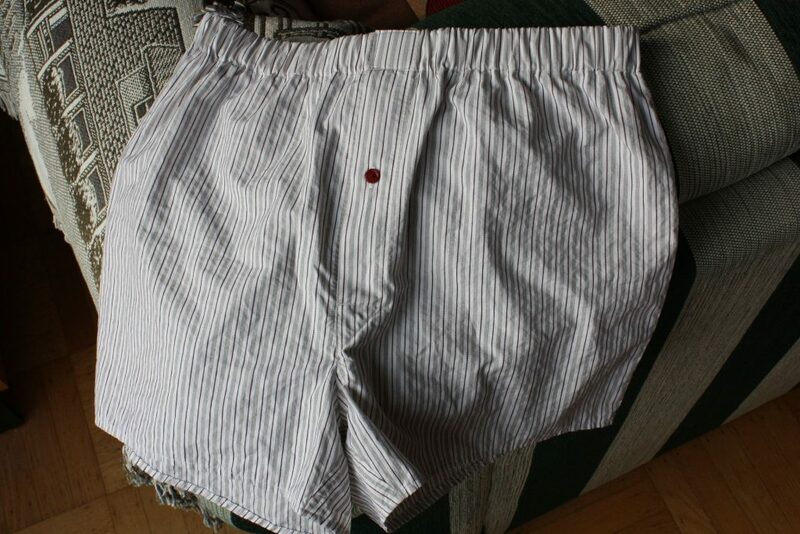 I had about a yard of spare fabric after completing the Peppermint Stick Shirt, so I made matching boxers. This entry was posted in Completed Projects, Recycling, Underwear and tagged peppermint-stick-shirt on August 23, 2016 by mportuesisf. I’ve been working on what was intended to be a “test shirt” for my Pink Shirt pattern, to make sure there were no mistakes in drafting out the feature details. Along the way, I realized it was a bit of a shame to call it the “Study for the Pink Shirt”. It was turning out to be a beautiful shirt in its own right, that I knew I was going to enjoy wearing. I also noticed the stripe pattern looks just like a candy cane. And the buttons I chose look like cinnamon candies. So here I present some photos of the completed Peppermint Stick Shirt. This entry was posted in Completed Projects, Shirts and tagged peppermint-stick-shirt on August 19, 2016 by mportuesisf.